What we have above is a heliolitid coral known as Protaraea richmondensis Foerste, 1909. It has completely encrusted a gastropod shell with its thin corallum. Stephanie Jarvis, a Wooster student at the time and now a graduate student at Southern Illinois University, found this specimen during her paleontology class field trip to the Whitewater Formation exposed near Richmond, Indiana. Protaraea is a confusing taxon to my Invertebrate Paleontology students. 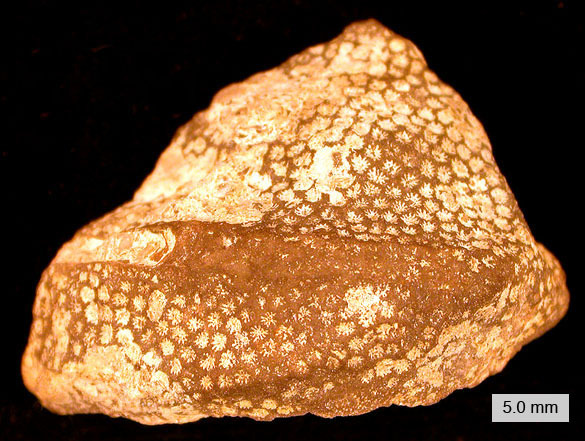 It is a very common encruster in their Ordovician field collections, being found on hard substrates as varied as rugose corals and orthid brachiopods. It is so thin, though, that it is hard to believe it was a colonial coral. Plus it has tiny septa (vertical partitions) in its corallites (the holes that held the polyps), very unlike most corals of the heliolitid variety. This is a group the students have to identify by matching pictures and taking our word for it. We can’t identify the gastropod underneath. Note that it has a sinus evident in the last whorl (an open slot parallel to the coiling). The coral grew right up to the edge of this sinus, preserving it and its extension through the shell. Foerste, A.F. 1909. Preliminary notes on Cincinnatian fossils. Denison University, Scientific Laboratories, Bulletin 14: 208-231. Mõtus, M.-A. and Zaika, Y. 2012. The oldest heliolitids from the early Katian of the East Baltic region. GFF 134: 225-234. Ospanova, N.K. 2010. Remarks on the classification system of the Heliolitida. Palaeoworld 19: 268–277. Part of your physical legacy at Wooster, Stephanie. I also just used Colorado River sediment you gave me as part of a Sed/Strat exercise! Hi Justin. I love looking at fossils people have found. You can send an image to mwilson at wooster dot edu.